Imams from more than 50 countries will be present together with 30,000 delegates from far afield as South Asia, New Zealand, North America, Africa and many countries in the EU to reaffirm Islam’s rejection of fanaticisms. Tight security will be in place for the event that will challenge head on the question of Islam’s role in the modern world and the need for the Muslim world to take meaningful steps to uphold the peaceful principles of Islam and defend the rights of people of all faiths and of no faith. A major Islamic conference is being held on 21-23 August in the leafy surroundings of Hampshire to discuss Islam’s response to contemporary issues. Imams from more than 50 countries will be present together with 30,000 delegates from far afield as South Asia, New Zealand, North America, Africa and many countries in the EU to reaffirm Islam’s rejection of fanaticisms. Tight security will be in place for the event that will challenge head on the question of Islam’s role in the modern world and the need for the Muslim world to take meaningful steps to uphold the peaceful principles of Islam and defend the rights of people of all faiths and of no faith. The highlight of the event will be the speeches delivered by the Caliph, His Holiness Hazrat Mirza Masroor Ahmad, who is applauded as a passionate advocate for justice and religious freedom and whom Prime Minister David Cameron has welcomed as ‘a man of peace.’ The Government’s Minister for Countering Extremism, Lord Ahmad of Wimbledon, who praised the Caliph as ‘inspirational’ in a meeting earlier this year, will also be speaking at the event as will a number of parliamentarians. The delegates will also hear from Tim Farron, the leader of the Liberal Democrats. 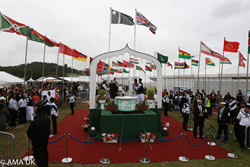 Organised by the Ahmadiyya Muslim Community, that has been advocating a rejection of violent jihad since its inception in 1889 and whose ethos is Love for All, Hatred for None, the message from the convention will stand in stark contrast to the jihadist violence in many parts of the world. And to make sure its powerful message is heard by all, the entire proceedings will be broadcast live globally, in 8 languages on satellite TV and on the internet. The Ahmadiyya Muslim Community collects for the poppy appeal, undertakes major charity projects in Britain and builds schools and hospitals in Africa. It organises peace symposia throughout the country. It organises charity runs, blood drives and homeless feeding sessions to show true Islam in action. The injustice in the world, especially the rise of extremism and nationalism that is fuelling tensions across the globe, is appalling. Muslims in particular are facing intense scrutiny worldwide. Ahmadiyya Muslim Community feels duty bound not to sit idle but to reclaim their faith, not just by words but by actions. This major international convention is a timely focus on Islam’s theological and practical response to the challenges of the world today. In London, we are offering opportunities for interviews, filming and photography, commencing one week in advance of the convention.